Found this on a website and thought I would share. You have three or more versions of the same disc. You are sure the color of the disc affects how it flies. You have started a Disc Golf Web Page. When designing your new house, one room on the blueprints is called “Hot Stamp Gallery Room”. You have ever advertised “Disc Golf Lessons” in a local newspaper. After playing a course once, you already know how it should be re-designed. Your boss catches you looking for new doglegs to throw around at work. You have ever bought a pair of shoes specifically for playing Disc Golf in them. You always carry your Disc Golf bag with you just in case you get some sudden free time. You have ever petitioned the IOC to make Disc Golf an Olympic Sport. You have spent more money on Disc Golf supplies than you have on your car. You have ever bought a disc for specific use on ONE hole. You accepted a job relocation to another town on the basis that a course was in the area. Your wife/husband doesn’t let you set the table because you throw the plates. You can’t stand the thought of not being able to buy just one more disc. You build a backyard swimming pool to be used only as a water hazard. If you keep track of your PDGA points. If you can tell someone your league average off the top of your head. You can point out a “discin'” callous on your hand. You called more than one friend when the “frolf” episode of “Seinfeld” aired. If you have named a pet “Bogie”. “Hyzer”, “Aviar”, or some other disc golf term. If you have ever thought about trying to build your own basket. If you have ever hung a disc on the wall and all your friends think it’s cool. You ever screamed YES! as loud as you can in a public park, then wonder why people are looking at you. The only quality time you get with your family is when you drag them out to the course to show them your great “S” flight path. You spend more than 3 hours searching for a lost golf disc. You have caused at least 3 of your friends to become addicted to the sport as well. You try to figure out how many golf discs you can buy with your next paycheck. When you miss a putt and whip out 5 more putters from your bag and throw each of them from the same spot just to prove to your friends that you could have made it. You go looking around the course to see if you can find any lost discs. You have spent so much money at the course pro shop, they name the course after you. You beg the course pro to put lights on the course so you can play all night too. You are golfing by yourself, and you let your “imaginary friends” tee first so you can show them how its done. You believe that with the right discs firmly grasped in each hand, you could fly. You have ever talked to your discs while they are in flight. You buy a membership in a gym, so you can improve your distance. You have ever called in sick to work on Monday; to play the same course you played Sunday. If you carry an extra version of a disc in case the first one breaks or gets lost. You introduce new discs to your other discs. You are willing to spend $400 a year getting a basket to start a new course but you still have the couch your mother gave you when you moved out. You throw your approach disc even after a really bad drive, just on principle. Your PDGA number is also on your car’s license plate. You skip Monday Night Football to attend a DG meeting. You decide it is too windy to go snowboarding, and opt to play a round of disc golf instead. You have ever attended a community meeting on behalf of disc golf. You have established the par from the water cooler back to your cubical. You carry copies of DGJ and DGWN everywhere you go so you can validate the sports existence to non-believers. You get into heated debates about what kind of discs beginners should use and for how long. You have ever developed a disc golf specific injury. You practice snapping a disc off at home while watching TV. You have ever chased down someone else’s dog to get your disc out of its mouth. You call ball golf…ball golf. You arrive at a tourney 3 hours from home and promptly spend all your lunch money on new discs. You have read this entire list! I will use the post to drive more user feedback. Take my brief review with a grain of salt, as I was forced to play with my non-dominant hand… still recovering from shoulder surgery. I am consistently getting more distance (20-40 ft) on every throw with both the D1 and D4. The D1 flies over stable, as intended. Prodigy claims the D1 flies well into a headwind as it does with a tailwind. I have yet to play in these conditions. The D4 is designed as a very fast, under stable driver. In my experience, this disc is not under stable. I would actually classify it as slightly over stable. Obviously, I am not getting a solid pop on my release, but I was expecting something along the lines of a fast Innova Roadrunner or Mamba (Definitely not the case). I figure a 150 class disc will make the D4’s alleged under stability more apparent. 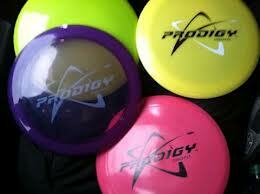 Overall I am happy with the purchase and look forward to throwing more Prodigy plastic. Both of these discs throw very well and get max-d with every toss. What are your comments / reviews? Grip and Rip DGC began as an outcropping from the Dogleg crew’s drive to bring another course to our hometown of Jasper, AL. The new course is still being decided by the local city council, but they are pretty close to making a final decision. When researching all the details for starting a club, I found the PDGA to have a helpful How-to guide. We cut our teeth with Discraft’s annual Ace Race tournament, which proved to be a valuable learning experience. Skills learned included: managing costs, gathering sponsorship’s, taking pre-registration monies, registering with the local park, setting up the course for tourney play and coordinating schedules with football season (if you are not from the Southeast, then you wouldn’t understand =)). With all this Ace Race tournament director experience, I decided to take the PDGA’s Officials Exam to better understand the rules for sanctioned play. PDGA Rules – The rules are interpretative in some cases. I am more of a casual player, so I don’t necessarily agree with all the tedious rules (just my preference). The 10 official’s exam can be taken an unlimited amount of times and is only $10, which is good for 3 years. The PDGA now has a Pre-Register Tool that allows tournament directors to collect payment online. It does cost $2-3 for the player to use, but the players list updates in real-time. I started building a GnR website with a forum to house all of the club’s activities. This proved to be more complicated than anticipated; so we setup a Facebook group under “Grip and Rip Disc Golf”. The events section is extremely helpful, since it allows local players to accept the tourney invite. The real-time feedback allows for us to judge the expected attendance ahead of tourney day. Contrary to popular belief, tournaments are time-consuming to run, and yield little profit for the club. However, they are beneficial in growing the sport. Without groups of disc golfers coming together with similar interests, new parks wouldn’t be built and existing parks wouldn’t be improved. Just in the Birmingham metro alone, there are 7 new parks coming online in 2013! I really hope we can continue growing this beautiful sport. Prodigy finally released the names of all their sponsored/vested players: Will Schusterick, Nikko Locastro, Cale Leiviska, Paul Ulibarri, Garrett Gurthie, Cameron Colglazier, Ricky Wysocki, Jeremy Koling, Catrina Allen, Sarah Hokum, and Paige Pierce. 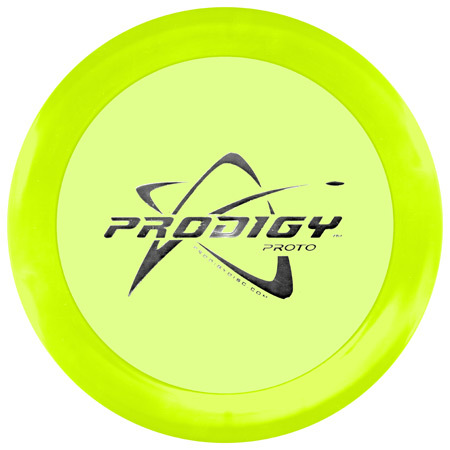 The D1, D2, D3, & D4 discs from new manufacturer Prodigy Disc, Inc. based in Georgia have been PDGA Approved as of 1/1/13. “All drivers in the D family are very consistent and with a much narrower flight paths than conventional long distance discs making them more accurate and forgiving. All four max weight at 174.3g. The D1 is a very fast, over stable driver designed for power throwers. Good for all conditions and flies just as well into the wind as it does down wind. The flight path is similar even in lighter weights. The D2 is a very fast, slightly over stable driver designed for all throwers. Good for all conditions and flies just as well into the wind as it does down wind. The flight path is similar even in lighter weights. The D3 is a very fast, moderately stable driver designed for all throwers and flies extremely far. The flight of the D3 is unique due to its ability to flip up and then glide without extreme turnover drift or a hard hyzer finish. Players can trust this disc when thrown with power knowing that it will flip up but won’t flip over. Phil mentions the D1 & D4 will be released in January, D2 & D3 in Feb, putters in March, then a line of fairway drivers. 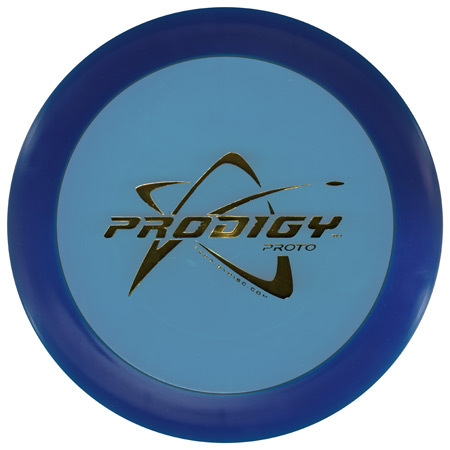 From my brief understanding of Prodigy, they have spent countless hours in R&D trying to build the perfect discs. They have limited the amount of unwanted side-to-side travel in the flight and have reduced the thickness of the rim on the high speed discs. I am really stoked to try these out as they are slowly released. 2 Rounds of 18 holes, one shot per hole… only aces count! No prior experience of disc golf required, all experience levels welcomed (Instruction for new players will be available) First Place will receive a stack of discs! For couples, BFFs, or family who will be participating, we have a doubles deal. For $35, two people can split the player pack with each person getting one disc to participate in the Ace Race. Players all throw the same model disc: a brand new, never-seen-before Discraft prototype disc that is introduced each year especially for Ace Race. All 2011 participants received a player’s pack that included 2 Z line prototype Drivers, sunglasses, Mini, sticker and a metal water bottle….a $50 package for only $25! Robbed from the DGB forum…. Join Disc Golf Birmingham and Innova Champion Discs as they host the DGB edition of Champion Clinic/Doubles. Jay is celebrating his 4th Putting World Title in a row and will have exclusive Custom 4X Yeti Pro Aviars by Nevada artist Skot Meyer. Des has very limited 2012 Innova Champion Team Star discs available. Come out to the park on Sunday and join us for the fun! So I got to break away for the weekend and run up to Huntsville for the Rocket City Blast that covered Monte Sano, Mastin Lake, Brahan Springs, and Redstone Arsenal. It was a warm 95 degree weekend that proved to be somewhat taxing on my stamina. Nonetheless I did get to see some interesting disc golf accessories along the way. The first two photos are of a homemade DG Caddy with built in cooler…. Very nice! This may turn into my summer project. The 3rd photo however is California Joe’s version of a DG caddy from a re-purposed baby stroller. haha good call sir! Below is a link to play fantasy disc golf. I will create a league for use to compete in, if there is enough interest. Hit me up if you want to join… its free! I have a slightly used Innova Competition DG Bag with straps $60.